Katrina Kaif and Ranbir Kapoor were spotted at the red carpet during the premiere of their latest movie Ajab Prem Ki Ghazab Kahani in Mumbai on Thursday evening. Preity Zinta lent her support to the launch of a crusade against child trafficking. Preity wasn't the only one. 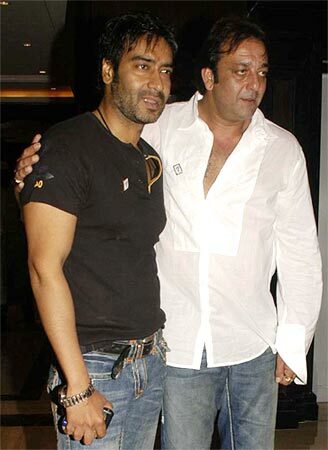 Ajay Devgn and Sanjay Dutt joined in the fight against the evil illegal practice as well. Slumdog Millionaire stars Dev Patel and Freida Pinto may deny that they are a couple. Yet, they looked like one when they attended the 18th annual BAFTA/LA Britannia Awards in Los Angeles on Thursday. Desperate Housewives star Eva Longoria Parker poses as she arrives at the 10th annual Latin Grammy awards in Las Vegas, Nevada on Thursday. When Katrina & Ranbir got dirty! Udita, the beauty who stole the show!